Constructing a perfect Eggplant Parmesan takes time, patience and a methodical approach. I was shown how to make this meat free recipe when I was about 12 years old and like most of my recipes, it has evolved over time. The most significant change I have made to the dish is that I now always make my own sauce so that the perfect level of acidity is achieved to compliment the robust flavors of the ingredients. In this page I will show you step by step how to make your own mouth watering Eggplant Parmesan, including any tips and tricks that I’ve picked up along the way, and I promise that all the effort that goes into making this dish is absolutely worth it in the end. The very first thing that you need to do is prep your eggplant. The eggplant must be peeled and I’ll tell you right now, they really don’t like being peeled. The easiest way to go about this is to chop off the top and chop off the bottom and then take your potato peeler and gently work from the cut edge downward. Once the eggplant is peeled slice it into disks a quarter inch thick and try to get them all as uniform in thickness as possible. If they are any thinner they’ll just turn into crunchy breadcrumbs once fried with little to no eggplant flavor remaining. 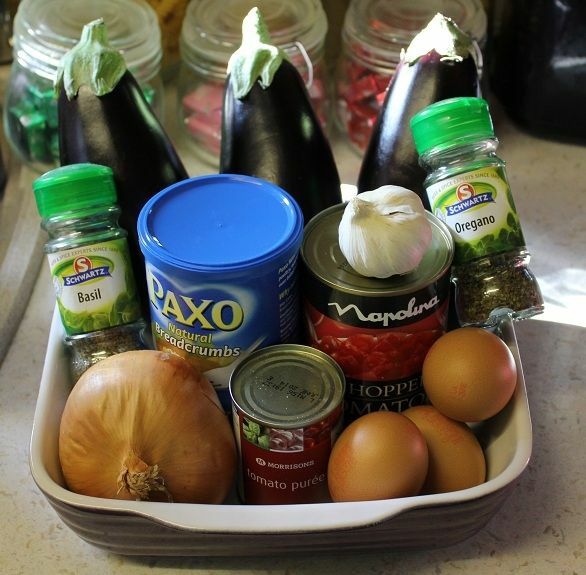 Any thicker and the eggplant will not cook by the time the breadcrumbs burn when frying. After all of the disks are cut you need to start wicking some of the moisture out of the eggplant. If you forgo this step your Eggplant Parmesan will be very soggy and it will absorb more oil when it’s frying. Lay out paper towels on a clean counter top three towels thick and place the disks on top in a single layer. Next sprinkle a little bit of table salt on top. 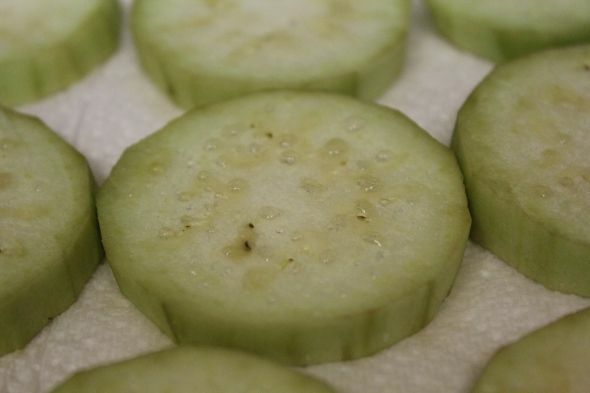 You don’t need a ton of salt, just pour some into your hand (maybe half a teaspoon) and with your fingertips lightly sprinkle all over the eggplant disks. The salt helps to draw the moisture out of the eggplant and it adds a bit of flavor to the cooked dish as no salt is added to the sauce. Please note that the paper towels will be getting the majority of the salt so don’t worry about making it all too salty. After half an hour flip all of the disks and repeat the salting. First chop the onion, garlic and mushrooms. I like to zap my onions and garlic in my mini food processor to make them very finely minced. 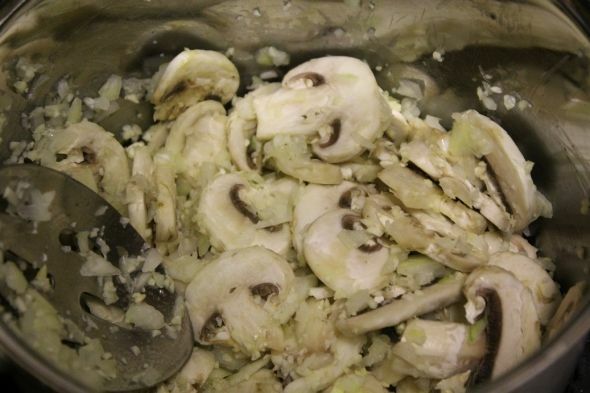 Next, fry off the onions, garlic and mushrooms with a little bit of olive oil until the water is cooked out, the onions are clear and the mushrooms are reduced and tender. 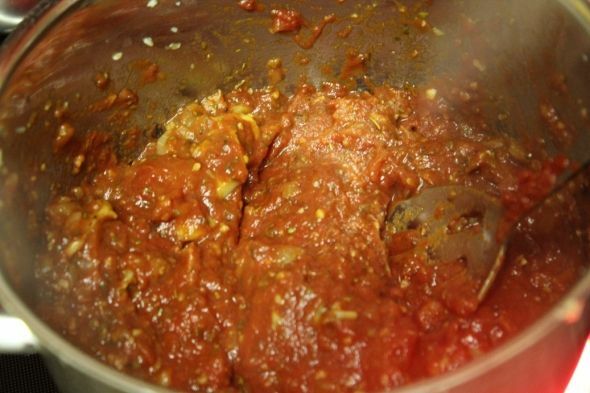 After all the veggies are cooked you can pour in the tin of chopped tomatoes as well as the tomato puree. Reduce the heat to medium and add the oregano, basil and sugar. If you prefer a runnier sauce this would be an ideal time to blitz the mixture with a handy stick blender. Allow to simmer for approximately half an hour stirring periodically to ensure the bottom does not burn. Set to one side and allow flavors to diffuse until it is time to layer the Eggplant Parmesan. After you have left it to settle for a while and it’s cooled down, taste it to see if you’re happy with the acidity. If it’s too acidic for you, just add a little more sugar. Breading the eggplant is a bit messy. First take all of those lovely eggplant disks and stack them in a pile. Next lay out a big sheet of aluminium foil on the counter top because this is where they are going to live once they’re coated. Now set up a little assembly line with easy access to the foiled counter top with the pile of eggplant, followed by the bowl of raw egg and ending in the breadcrumbs. Take each slice of eggplant individually and dip in egg then coat in breadcrumbs. I like to double bread my eggplant by re-dipping it in the egg and then adding another breadcrumb layer but it’s not essential. 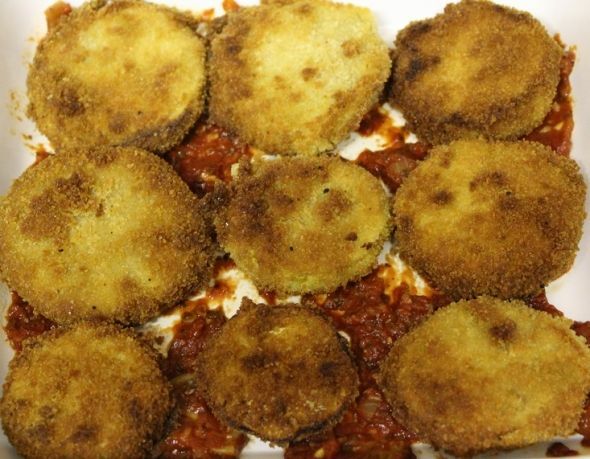 Lay each individual breaded eggplant slice on the foil sheet in a single layer and repeat the process until they are all breaded, topping up the eggs or breadcrumbs as necessary. You will be getting clumps of eggy breadcrumbs mixed in with your fresh breadcrumbs. Don’t pick them out, use them to your crispy advantage and just keep rubbing them apart and reusing them to coat the next slices of eggplant. The trick to frying the eggplant is to brown them on both sides until they’re very dark and almost burned. Just heat up about half an inch of cooking oil, in a frying pan on a medium high heat until it bubbles away nicely when a few breadcrumbs are dropped in. 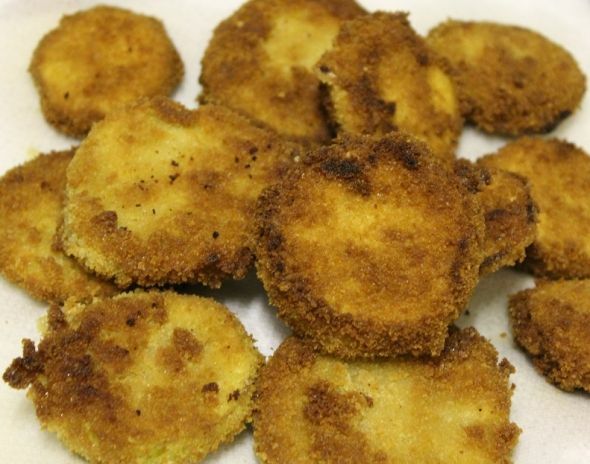 Then fill the pan with breaded eggplant disks in a single layer and fry each side. 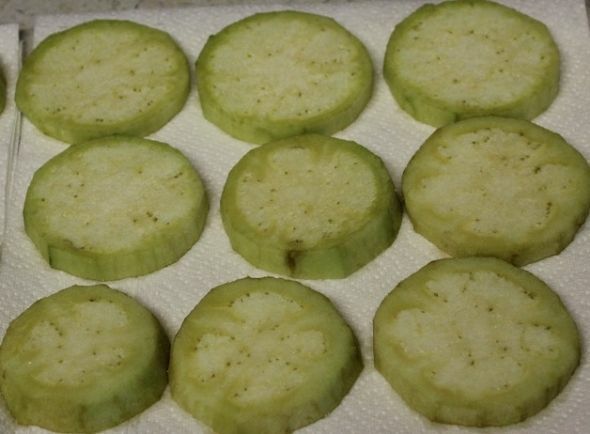 Remove cooked eggplant from oil and place on paper towels (to absorb excess oil) in single layers. Repeat until all eggplant disks are fried. Now comes the easy part. 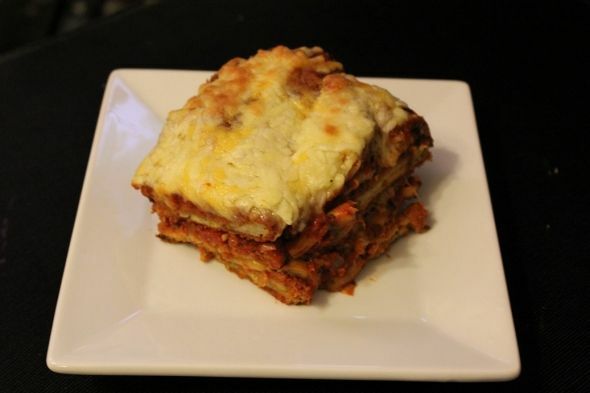 You layer an Eggplant Parmesan just like a lasagne without meat and ricotta. Just put down a bit of sauce with a layer of eggplant followed by more sauce and a layer of cheese followed by more eggplant and continue this until you reach the top of your baking dish. You’ll be using the majority of the sauce that you’ve made so be generous. All those lovely breadcrumbs are going to soak it right up. Top the whole thing with cheese and all that is left is to warm it through. 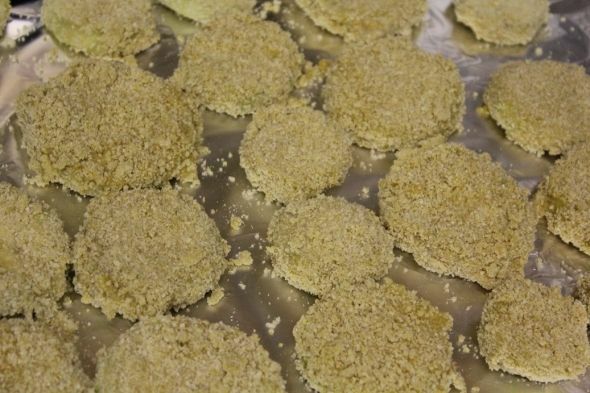 If you are able to leave the fully assembled Eggplant Parmesan to sit for 2 or 3 hours before baking it will be even better because the sauce will have an opportunity to soak into the breadcrumbs! 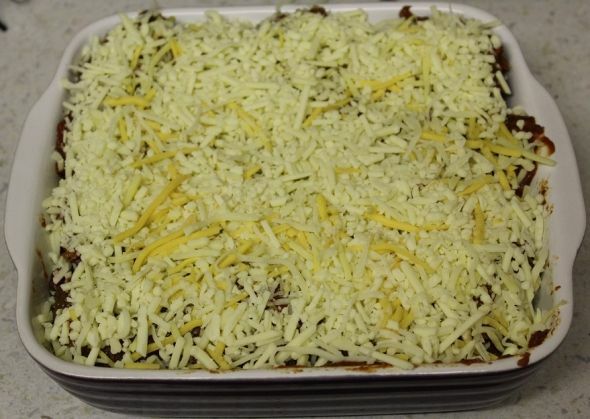 Once it’s fully assembled it’s only going to need about a half hour in a preheated oven to warm through and melt all that cheese at 180c or 350f. 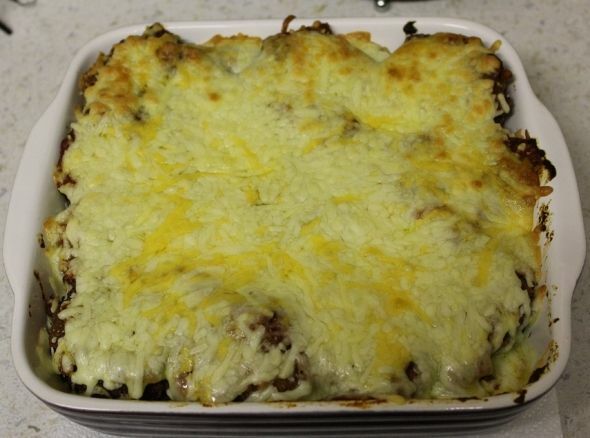 Just check that the cheese is nicely browned on top and it’s all ready to serve up. Eggplant Parmesan will keep in the fridge for at least 4 days covered in plastic wrap. It will then reheat beautifully in the microwave. It also freezes and reheats very well when stored in an air tight container.